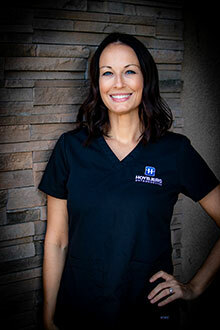 I’m Darcy, one of the RDAs here at Hoybjerg Orthodontics. I began working here in 2015, almost ten years after beginning my career in dentistry. My days generally involve assisting Dr. Hoybjerg with patients in the back office. I love working with my amazing team members and our awesome patients! My favorite part of my job is sharing in our patients’ happiness when their braces come off and they see their new smile for the first time. When I’m not at work, I enjoy spending time with my family. We enjoy the outdoors and watching our favorite sports team, the San Francisco Giants! 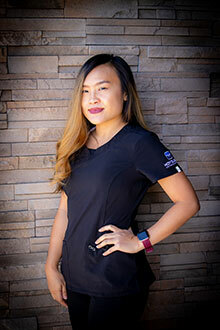 Hi, my name is Daydra and I am an RDA here at Dr. Hoybjerg’s. I have been with this team for a little over a year and a half, and it’s been amazing! You will see me in the back office assisting Dr. Hoybjerg and working on patients. My favorite thing about my job would definitely be watching our patients’ smiles transform into that perfect smile they have always wanted, and helping give them that extra boost of confidence. I love getting to know our patients. They are what truly make this job so rewarding. When I’m not in the office working, I enjoy spending time with my family, playing softball, and doing anything that involves the outdoors. From our front desk, I help patients on the phone and in person. I coordinate and organize appointments and administration to make sure our office runs smoothly. I’m also one of the first people to welcome our patients into the office! Each day, I get to build and strengthen relationships with our patients. I love to make our patients happy and feel comfortable at this wonderful office. It’s my home away from home! When I am not in the office, you will find me working at our family’s hay farm. I also love doing crafts and DYI projects, creating projects in my woodshop, and hanging out with my family and my dog Tillie. As a dental assistant, I always work side by side with Dr. Hoybjerg. My priority is to make sure everyone feels comfortable and to keep our patients smiling during visits. My favorite part of my job is seeing patients’ amazing transformations during care. Nothing’s better than a patient with a huge, beautiful, confident smile when treatment is finished! When I am not at work, I enjoy the outdoors and weekend adventures with my little family and our fur babies! I also enjoy hunting and riding horses! My name is Kristen. 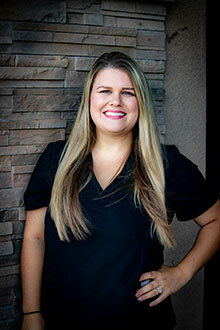 I am a registered dental assistant at Hoybjerg Orthodontics. You will see me working in the back office when you come in for your appointments. I can’t wait to meet you! 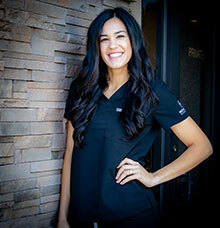 I have been working in the dental field since 1999, and I love working in orthodontics. My favorite part of my job is watching your smile transform! I enjoy getting to know patients during visits with us. I am grateful to have a wonderful, caring doctor and an awesome team to work with every day! Outside of work I like to do outdoor activities and spend time with my family. I have been working in the dental field since 2009 as dental assistant and received my registered dental assistant license in 2010. I was given the opportunity to work in an orthodontic office and decided to take advantage of it. This change has been a wonderful experience. I’ve been with Hoybjerg Orthodontics since February 2014. What I love about my job as the financial coordinator is that it is my goal to make sure our patients understand and feel satisfied with their financial options. I also love the insurance/billing aspect and do my best to get our patients the most out of their dental benefits! I love working with our team because everyone is passionate about their work. Everyone is friendly, knowledgeable, and ready to help with your orthodontic needs! It’s amazing to see the changes in patients’ confidence during the transformation of their smiles, and it’s so rewarding that I was able to be a part of supporting them to reach great results. I always tell everyone, “I don’t live to work, I work to live!” So aside from work I love spending time with my husband Lou and our son Cheng Lou. We’ve lived in Marysville since we got married in 2009, and we also volunteer in an immigrant community from Southeast Asia. In my free time, aside from relaxing at home, I love to choreograph dances or travel with my family. Building a relationship with each of our patients makes me love my job. They are such great people and so many are excited about their orthodontic treatment; they get increasingly excited as they get closer to completion, and our team gets excited, too. We know the difference that a healthy, beautiful smile can make in someone’s life, and to be able to do that for a patient who’s become a friend is truly a great feeling. Here at the office, you’ll find me providing chairside assistance. I help Dr. Hoybjerg place the braces and change the wires. I also make sure that patients are seen on time and that everything moves smoothly for them, whatever they need. I was raised here in the Yuba-Sutter area and love my community. My husband Jon and I welcomed our son Abel into the world in May 2012. As a family, we enjoy camping, fishing, hiking, and cooking. I have absolutely loved working in the orthodontic field for more than 20 years!! The orthodontic office is such a wonderful place; it provides so many amazing opportunities. Watching young patients grow into young adults with gorgeous healthy smiles is the best thing to experience here at Hoybjerg Orthodontics!! 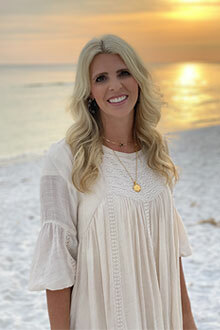 I am there to lead and guide you through your first appointment alongside Dr. Hoybjerg. 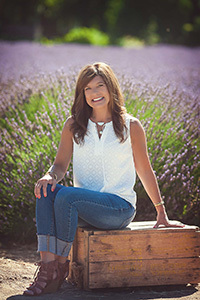 As a marketing consultant, I am devoted to enhancing the orthodontic experience through internal marketing systems, community commitment, and extraordinary customer service from our exceptional orthodontic team!! I love working in orthodontics and being part of a great team that makes positive changes in the lives of our patients. Watching the patients’ self-esteem and confidence emerge and strengthen as their treatment progresses and they begin to see the visible changes to their smiles is wonderful. But the day that the braces come off and they are laughing and smiling, showing the world their healthy, straight teeth, is incredible. I majored in public health, so working here and helping with management, as well as handling our public relations, is a perfect fit for me. It’s an added bonus that I am married to our orthodontist! Dr. Hoybjerg and I have four children we adore: three sons and a daughter. We love to travel this beautiful state as a family, and explore all that it offers. I also enjoy sewing, cooking, baking, and making memories with my family. I love making sure our patients receive the best possible care and keeping them entertained at appointments. Nothing makes me happier than to see big, beautiful smiles, and here we make them happen! My dental field experience started in 2011 and I joined Hoybjerg Orthodontics in 2017. This is an incredible office, with a doctor and team who work hard, love good food, love to have fun, and love making people smile! I work at the front desk, where I greet patients and schedule appointments. I also take records for patients before they get their braces and provide backup to the other assistants. My handsome husband Dave and I still have two babies at home: our dog and our kitten! I have three grown children who live too far away from me, in Utah. In our leisure time, Dave and I like being outdoors: fishing, kayaking, camping, and hiking are always enjoyed. I also love reality TV shows and was a contestant on “Family Feud”!